Lonestar is a gorgeous light rose grey with an incredible line up on his ARI. This combination of outstanding genetics hit it out of the park. 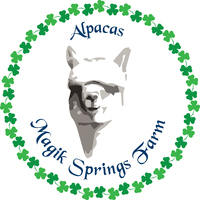 He is exactly what every grey breeder should be looking for to enhance the next generation of excellence on their farm. This handsome stud's genetics were chosen to compliment our black and fawn production females and also to offer to the mid-Atlantic region a very rare bloodline for this side of the Mississippi. His offspring are just beautiful! All girls - and light rose grey or black. 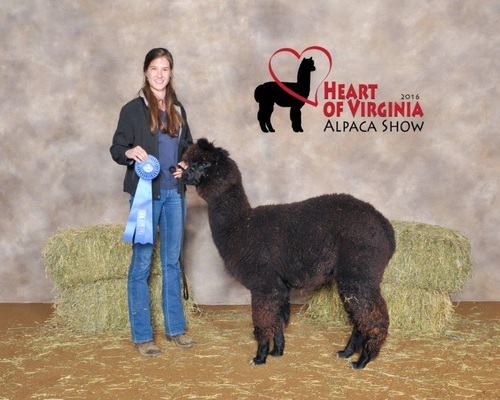 His daughter Maeve owned by Magik Springs Alpacas just took her first (of many) blue ribbon at the 2015 VA Classic. Judge's comments were "extremely uniform and extremely large fleece. Stunning presence with beautiful color and bone structure." Great comments on a juvi - she's just getting started. This herdsire is the real deal. Lonestar is set to take your grey breeding program to the next level. Rare bloodline plus your production gals equals money in the bank. This is the future of grey. Ebony Swan is a beautiful, fine blue black female that draws your eye to her. Very elegant and as a momma, there's none better. Ebony has fine uniform fiber, a trait she passes to her offspring. Ebony's offspring sell well. Ebony is out of a silver grey dam, Wolf Den Raven who traces her genetics back to the legendary Lanark line of blacks & greys. 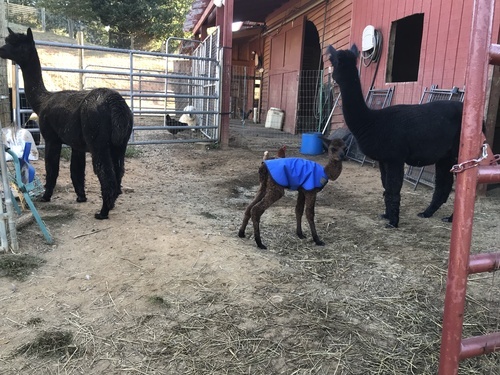 Ebony is conformationally perfect and has impressive mothering abilities, producing strong healthy crias with lots of vigor, high IGGs and loads of milk. Ebony has produced nothing but exceptional crias, her first was a true black daughter with amazingly fine fiber (spinners are here on shearing day for this fleece!) a bay black son, Crusader, that just glows with brilliance to his fleece, a glowing gray female, an exceptional black son and a second carbon copy black daughter whose fiber sells very well . Ebony is solid production stock to take your blacks and greys to the next level.